This exchange is especially noteworthy, because Trump wants to create a vaccine safety commission that could roll back vaccine laws based on the widely discredited theory that vaccines cause autism. Since as early as 2012, Trump has falsely claimed there is a vaccine-autism link. On the presidential campaign trail, Trump again cited the junk science to explain the reason he believes so many children are diagnosed with autism. So, is autism on the rise? Quenneville spoke specifically about the increase of students with autism at Kilmer Center. During her conversation with Trump, she also spoke in general about autism prevalence rates in the country (1 in 68). She told The Fact Checker that she was referring to the shift in the student population at her school: Over the past five years, the number of students with physical disabilities has declined, while the number of students with autism has increased. But Trump then said that autism has seen a “tremendous amount of increase,” and he asked about the increase at her school. It’s unclear whether Trump misunderstood Quenneville. The White House did not respond to our request for clarification. Quenneville: Hi, I’m Jane Quenneville, and I’m a principal of a special-ed center in Virginia, serving children ages 5 through 22 with autism and physical and medically fragile conditions. Trump: How is that going? Trump: Have you seen a big increase in the autism with children? Quenneville: Yes, in fact, our school has shifted its population, so more children with autism, definitely. Trump: So what’s going on with autism? When you look at the tremendous increase, it’s really — it’s such an incredible — it’s really a horrible thing to watch, the tremendous amount of increase. Do you have any idea? And you’re seeing it in the school? Quenneville: Yes, I think the statistics, I believe are 1 in 66, 1 in 68 children are diagnosed with autism. Trump: … which is just amazing. Well, maybe we can do something. The change in autism prevalence is a controversial issue. The definition of autism has changed over the years, making it difficult to make an apples-to-apples comparison of rates, and autism figures vary widely across different states. About one in 68 children in the country has been identified with an Autism Spectrum Disorder (ASD), according to a 2016 report by the Centers for Disease Control and Prevention’s Autism and Developmental Disabilities Monitoring Network. The rate in the 2016 report was the same as it was in 2014 — and the definition for autism was broadened in 2013. The CDC said it is not yet clear if the 2016 mean autism rates are stabilizing. CDC data show the rate of autism increased since 2000, when about one in 150 children were identified with autism spectrum disorder. But it’s problematic to compare autism rates over the last three decades, because the criteria for diagnosing autism have changed with revisions of the Diagnostic and Statistical Manual (DSM). In 1983, the criteria for “autistic disorder” were more restrictive. More disorders were added since then, broadening the range of disorders that now meet the definition of the Autism Spectrum Disorder, according to the Autism Science Foundation, a nonprofit that supports autism research and raising awareness of the disorder. “Due to inconsistencies in diagnosis and how much we are still learning about autism, the most recent DSM (DSM 5) only has one diagnosis, autism spectrum disorder (ASD), which encompasses each of the previous four disorders,” according to the foundation. DSM 5 was released in 2013. It’s not clear whether the growth since 2000 means the number of people with the disorder is increasing. Advocates for autism research say this is why more credible studies need to be funded and conducted. The CDC and experts note that much of the increase in cases may be the result of improved awareness, diagnosis, early screening and changes in the classification and identification of Autism Spectrum Disorder. “Autism used to be diagnosed only in children with severe language and social problems and repetitive behaviors, but several years ago, researchers expanded the criteria for diagnosis to also include autism spectrum disorders — a wider range of developmental conditions associated with autism,” Time Magazine reported in 2012. There are too many unknown factors to say that Autism Spectrum Disorder is truly on the rise. The number of cases has increased since 2000, but it’s unclear how much of a role greater awareness, early detection and changes in the definition of autism contributed to that increase. About one in 68 children in the country has been identified with an Autism Spectrum Disorder, according to the CDC’s 2016 report. That was the same rate as 2014 — just after a new, broader definition of autism was released. That’s about all we know so far. Trump characterized it as an increasingly common disorder, but there’s not enough research and no medical consensus as to whether autism is on the rise. 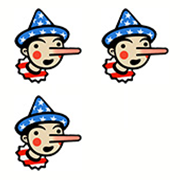 We award Trump Three Pinocchios.